I hear that phrase all the time on radio shows. Most times, I think it’s stupid. This time, I think it kind of fits how I’m feeling. Why? Because I’m a long time food blog reader and first time food blogger. This post is gonna be messy, folks, but the recipe is tasty. So if you don’t like it, GET THE HELL OUTTA HERE CUZ I’M TRYING! Just kidding, send me feedback and I’ll see what I can do. Today I share with you a go-to recipe that is perfect for the summer, but also gets me through the hard times in the winter. Here’s the deal: I came home from work on a frigid February day and wanted something to warm me up. A lot of people turn to soup, but I turned to the tropics. Typically I grill this dish, but upon bundling up and braving the cold to turn on the grill, I discovered it had run out of gas. Cursing at having frozen hands, I trudged back inside and resorted to making the pork in the oven. It turned out nearly as well as the grilled version. -If baking, preheat oven to 425 degrees. -Rub the pork tenderloin with a generous amount of seasoning. 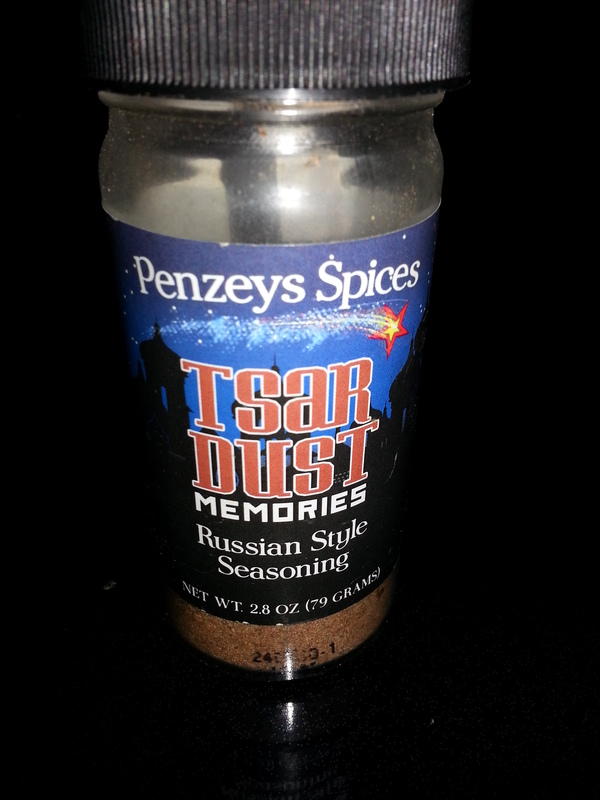 I like Penzey’s Tsardust Memories because it’s a mix of sweet and savory. You can get a similar effect if you use Jamaican jerk seasoning, but usually that will be spicier and not quite as smooth as Tsardust. I’ve done both and can tell you it’s delicious either way. -If grilling, sear the tenderloin on medium-high to high heat for about 1-2 minutes on each side. You should get a nice, thin crust/coating. Turn heat to medium and grill for about 20-25 minutes. At 20 minutes, check the meat in the middle where it’s thick, not on the ends where it cooks quickly. It’s OK to have a little pink in the middle. Remember that your meat will continue to cook for a short bit after you take it off the grill. -If baking, sear the tenderloin on the stove at medium-high to high heat for 1-2 minutes on each side. Put the tenderloin in an oven-safe pan (it’s OK to coil the pork as necessary) and bake for 25-30 minutes. At 25 minutes, check the meat following the guidelines above. *Note: Pork can dry out quickly, so if you’re not used to cooking it, try checking it more frequently. 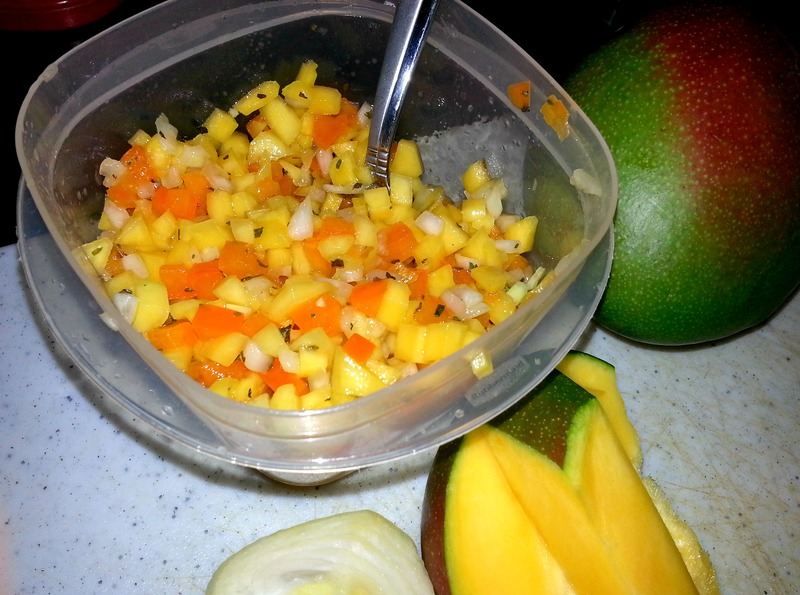 -While the meat cooks, dice/mince the mangoes, onion, and yellow pepper. Mix together in a bowl and toss in the mint. Now here’s where the magic happens. You know those fancy oil and vinegar stores that have popped up everywhere? You know how you go in and think “What in the heck am I going to do with any of this stuff?” Friend, I have the answer. In addition to being great for basting foods while grilling, flavored oil and vinegar make amazing dressings for salads and salsas. Here are the types I purchased a few months ago from local establishments. The oil is infused with an amazing lime flavor, and the coconut white balsamic vinegar is so good I just want to drink it directly from the bottle. Pour the oil and vinegar over the salsa and mix well. Chill the salsa while waiting for the meat. -When you have about 10 minutes left with the meat, heat the butter in a skillet on medium until it melts. Throw in the sliced plantains. After about a minute, sprinkle generously with smoked paprika. 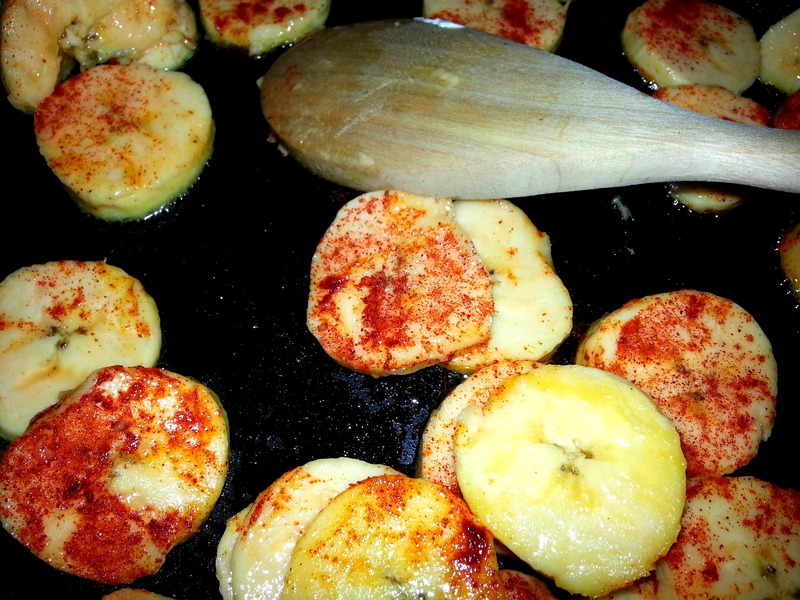 After another minute or so, try to flip the plantains, and sprinkle the other side with paprika. Saute until golden, flipping as necessary. Yes, I know many people try to pan fry the plantains by submersing them in lots of scalding oil. But just as I typically don’t cook with salt, I typically don’t fry foods or use excessive amounts of fats. I’ve had several people tell me these plantains are “amazing” so I’m going to stick with my recipe and forgo the greasy method. I also like the extra flavor the butter provides, compared with oil. *Note: The longer the plantains cook, the sweeter they are. *Double Note: You can drizzle a small amount of rum into the pan at the end of cooking to deglaze it and create a nice flavor. Remember, though, that rum basically is sugar so your plantains will be even sweeter. 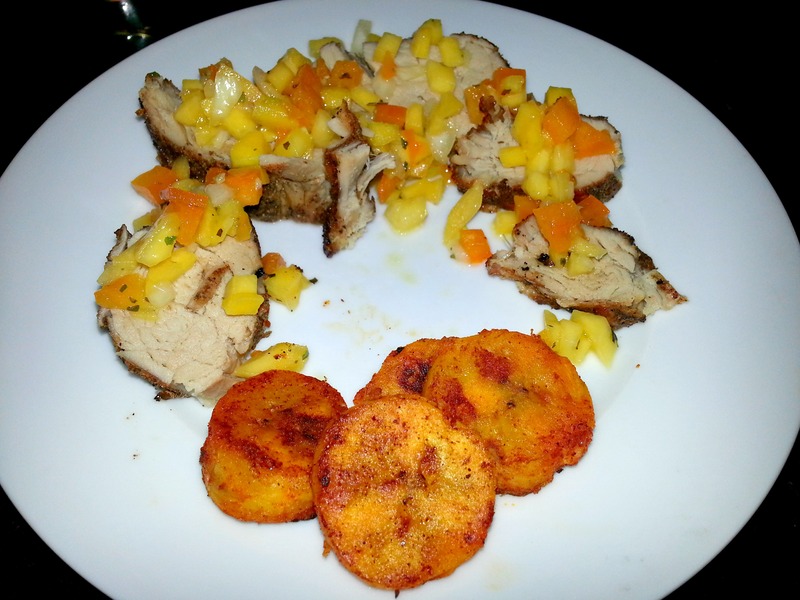 After all the cooking, cut up the pork, slather on the mango salsa, and put some plantains on the side. This meal can be made in about 30 minutes (45 if you’re a slow chopper) if you have all the ingredients handy. I love this tropical dish because it kicks my taste buds into gear no matter what time of year it is. I hope you enjoy it as much as I do! that looks delicious!! And I’ve never seen that Penzeys spice before! I must find it!! Thanks, Stef! I think pork tenderloin is such a great, versatile go-to because it works with so many flavors and cooks quickly. You definitely should try the Tsardust, it’s one of my faves!